The Russian Progress resupply ship MS-08 has docked with the International Space Station, two days after launching on a Soyuz 2-1A rocket. Docking was marked at 10:38 UTC. The original launch was to result in docking at the International Space Station (ISS) just 3.5 hours later on Tuesday. However, it was scrubbed with just seconds remaining in the countdown at the Baikonur Cosmodrome. This record attempt was also set to take place during the previous Progress launch. However, it was called off via a scrub very similar to the scrub that was suffered on Sunday during the MS-08 launch attempt. The initial attempt was scrubbed with just seconds remaining in the countdown. No reason has been given for the scrub at this time, with Roscosmos only noting the next attempt was reset for Tuesday and the fast rendezvous plan was removed from the mission profile. 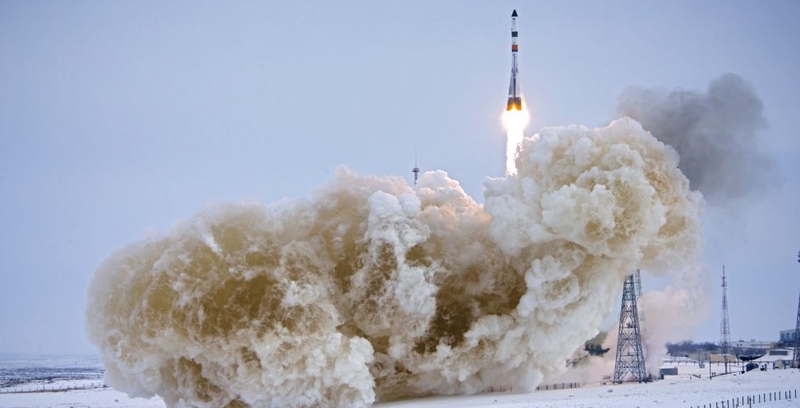 This launch was conducted by the Soyuz 2-1A and occurred without issue. The Soyuz rocket is derived from Sergei Korolev’s R-7, which became the world’s first intercontinental ballistic missile (ICBM) when it made its maiden flight in 1957. A modified R-7 was used to deploy the world’s first satellite, Sputnik 1, later the same year, and the R-7 would also form the basis of the Vostok rocket that carried Yuri Gagarin into orbit in 1961 – as well as the later Voskhod rocket. 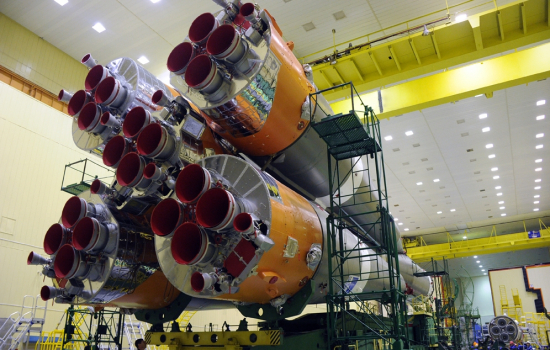 Three different versions of the Soyuz-2 have been developed. The Soyuz 2-1A is simply a modernized version of the previous Soyuz design. 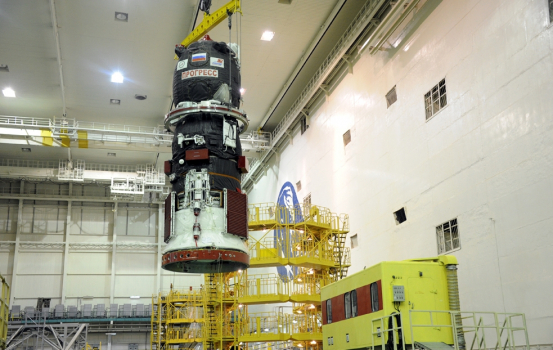 The more capable Soyuz 2-1B has a modified third stage with a new RD-0124 engine. The Soyuz 2-1V is designed to carry smaller payloads. Based on the Soyuz-2-1b, it flies without the four boosters that normally make up Soyuz’ first stage and has an NK-33 engine powering its first stage – Soyuz 2-1B’s second stage. Progress missions are routinely used to test new procedures ahead of their use on crewed missions of Soyuz. Normally it takes around two days to reach the ISS, which is the standard option if controllers abort the fast-track approach. That is now the case with the first attempt scrubbed. The new super fast rendezvous is set to be tested on the Progress MS-series (which uses the same software and engine systems as the Soyuz MS-series) craft’s ability to perform the complex rendezvous profile under a strict set of conditions and a tight timeline. Progress MS-09 is likely to be the next attempt. An outline of that plan – which will be tested on a future mission – involves a path that begins after orbit insertion is accomplished, with the Progress’ orbital parameters immediately discerned via spacecraft communication with Vostochny Cosmodrome’s tracking stations in eastern Russia. If all of those parameters met the specifications needed for two-orbit rendezvous, MS-08 would have embarked on its super fast trajectory to the ISS. Options still exist to default after launch to a standard 34 orbit, 2 day rendezvous profile should something occur in the opening minutes of the mission that would preclude fast track docking. However, per any future two orbit, 3.5hr rendezvous plan, Progress will perform the DV-1 burn ~41 mins into the mission – changing its velocity by 24.52 m/s and beginning the process of aligning itself with pinpoint accuracy into the ISS’s approach corridor. The automated rendezvous sequence will start ~62 mins after liftoff. Progress would execute the Impulse 1 burn 81 mins after liftoff, further changing its velocity by 46.559 m/s. Onboard the Station, the crew begins final preparations for Progress MS-08’s arrival 93 mins after the craft’s launch when Motion Control of the Station will be transferred from the USOS (United States Operating Segment) to the Russian Segment. This will be followed by a short 1.992 m/s delta-V Impulse 2 burn by Progress and the activation of the Kurs-P communication system on the ISS’s Zvezda Service Module. One minute later, Progress’ corresponding Kurs-NA system will be activated at a Mission Elapsed Time (MET) of ~1 hr 53 mins. Progress will then conduct the Impulse 3 burn (delta-V of 35.917 m/s) at MET 2 hrs 6 mins. Confirmation of Kurs-P range data from the Service Module’s system will be taken at MET 2 hrs 19 mins – at which point Progress will be just 45 km (28 mi) behind the Station. At this point the fast and standard approaches merge, with Progress MS-08 closing in another 15 km (9.3 mi) on the Station, at which point its Kurs-NA antenna was activated. Eight minutes later, at MET 2 hrs 32 mins, a full-up Kurs test between Progress and the ISS SM occurred – and Progress was just 15 km (9.3 mi) from the Station. 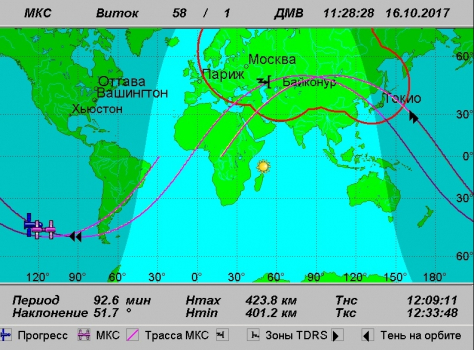 With Progress at 9 km from ISS, the Station’s VHF-2 transmitter was activated. This transmitter is a vital part of Progress’ TORU (Teleoperated Mode of Control) automated docking system’s ability to safely and accurately guide the craft through a completely automated rendezvous to ISS. VHF-2 transmitter activation occurred with Progress’ VHF receiver activated 11 mins later. Progress performed the Impulse 4 burn to change its velocity by 5.897 m/s and bring itself to the Ballistic Targeting Point 2 km from the ISS just seconds later. At this point, Progress MS-08 TORU command link tests, Progress TV camera activation, and final ISS system power-downs and command inhibits were put in place. The Impulse 5 and 6 burns further changed Progress’ velocity by 5.755 m/s and 1.705 m/s, respectively. Progress flyaround of the ISS commenced, at the conclusion of which Progress was properly aligned for final approach. First, Progress initiated station keeping operations to hold relative position with the ISS as final alignment and system checks completed. Once a “go” to proceed was given, Progress began its final approach. 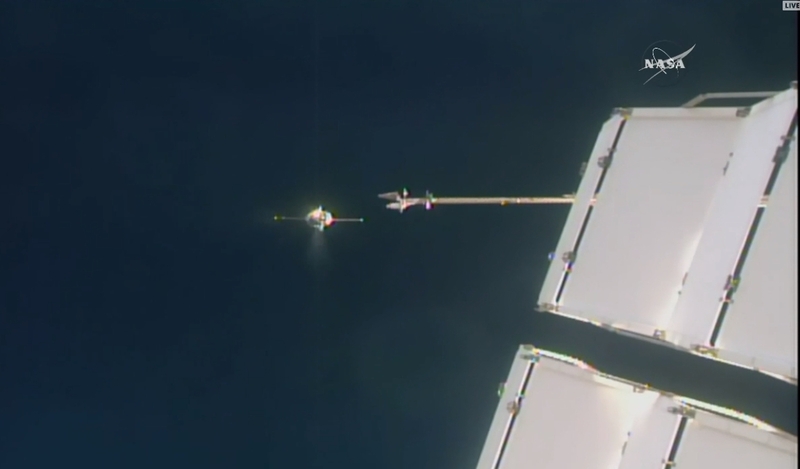 At the moment of docking, the ISS entered free drift to help dampen out relative motion between the two vehicles. Once those dispersions were gone, Progress drove its hooks to achieve hard dock. After this, the vestibule between the Station and Progress MS-08 will be pressurized ahead of hatch opening. The crew can then get to work to remove the multitude of cargo. This includes station propellant, compressed gases, water, scientific equipment and consumables for the life support system, as well as containers with food, clothing, medical supplies and personal hygiene items for the members of the crew. In total, 1390 kg of “dry cargo” is being carried, along with 890 kg of propellant in the refueling system tanks, 420 kg of water in Rodnik systems tanks, as well as 46 kg of bottled compressed oxygen.